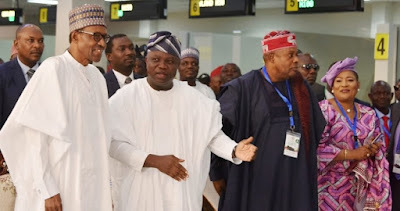 Lagos State Governor, Akinwunmi Ambode on Thursday evening urged President Muhammadu Buhari to seriously consider the possibility of granting Lagos a Special Status to enable it sustain its position as the driver of the nation’s economic growth. 26 years after the Federal Capital was relocated from Lagos to Abuja, the State has been left to strive for development without much Federal support. The Nation reports that governor said despite the strategic position the State plays in the nation’s economy, there was still much untapped potentials and opportunities for economic, social and cultural growth in the State, which he said his administration was doing its best to explore by strategically focusing on improving the ease of doing business, entertainment, sports and tourism. He, however, said that for these potentials to be realised, the State requires Federal Support, adding that several attempts by some eminent personalities to push for a Special Status for Lagos as well as a bill seeking to accord the State same was turned down by the Senate. “Mr President, it has become glaring that Lagos State cannot achieve this alone. Mr. President, 26 years after the Federal Capital was relocated from Lagos to Abuja, the State has been left without much Federal support. “Your Excellency, despite all these, Lagos State needs more and Lagosians deserve more. Eminent Nigerians have called on the Federal Government to grant our State a Special Status. I recall that a bill seeking to accord it a Special Status has been rejected three times in the Senate. 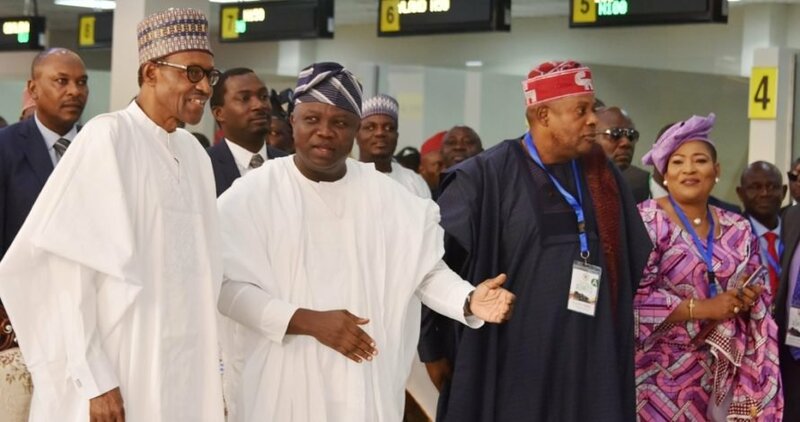 Lagos deserves a Special Status if we want the State to continue to serve as the major driver of the nation’s economy,” Governor Ambode said. Thanking President Buhari for magnanimously yielding the State’s request to reconstruct the Oshodi International Airport Road into a 10-lane world-class road and transform the Presidential Lodge Marina into a monument and cultural legacy, Governor Ambode also seized the occasion to request the President to cede the ownership and management of the National Stadium, Surulere and the National Arts Theatre, Iganmu to the State Government to enable it revive them for the benefit of all. “Mr. President your word has been your bond as far as your promises to Lagos State are concerned. You approved the reconstruction of the Oshodi to Murtala Muhammed International Airport Road into a 10-lane world-class road that will be ready by the end of this year. You gladly released for our kind use, your Presidential Lodge in Marina because you believe in our vision to transform the lodge into a monument and cultural legacy as part of the Onikan-Marina cultural and architectural regeneration. “In addition, as part of our drive to use entertainment and sports to drive tourism and economic growth, we again ask of Your Excellency to consider ceding the ownership and management of the National Stadium Surulere and the National Arts Theatre Iganmu to Lagos State. These two edifices have been left to decay and our government is in the best position to revive these assets and make them viable again for the benefit of all Nigerians. “This is not too much to ask but we are reassured that our President is a listening father who understands the yearnings of Lagosians. We are confident that he would listen and respond positively to the demands of about one-eighth of the nation’s population resident in Lagos,” Governor Ambode said. Speaking on Friday after conducting President Buhari round the Eko Atlantic City (EAC) which is a multi-billion dollar project expected to accommodate over 150,000 people who would reside there and another 250,000 who would work and commute within the city on a daily basis, Governor Ambode said the project was a practical example of how the private sector could partner with government to boost the economy. He recalled that the project, which was conceived and initiated during the tenure of former Governor of Lagos State, Asiwaju Bola Ahmed Tinubu, was a brilliant engineering display which had saved the whole of Victoria Island from ocean surge and other threats. “This project has actually saved the whole of Victoria Island and is standing on over 750 square kilometres bigger than Victoria Island itself when it is eventually completed. This is just an example of what the private sector can really do to the Nigerian economy and that is why we have made it possible that Mr President should take a practical tour of how we can really move the Nigerian economy when we partner with the private sector,” Governor Ambode said. Responding, President Buhari commended the initiators of the EAC, saying he was extremely impressed with the potentials of the project, which according to him, would create jobs and boost Nigeria’s economy. “I have just gone round to see the Eko Atlantic City. I’m impressed with the potentiality of this project and the amount of jobs and positive effect which this project is capable of having on the economy. “I’m really grateful for those who agreed to invest so much in our country to get a secured area for operations capable of handling big businesses and investments throughout Africa,” the President said.